Poly + Bark produces the DSW with stylish wooden legs, interconnected using black metal wires. The seat is made in a high quality and durable Polypropylene plastic, available in a variety of vibrant colors. 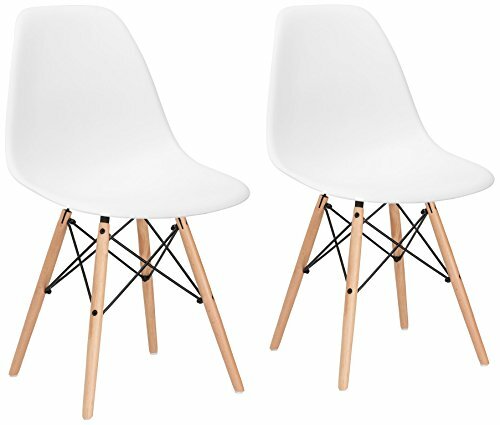 Charles Eames's DSW (Dining Side Wood chair) Molded Plastic Chair was a winning entry of the Low Cost Design Competition organized by the New York Museum of Modern Art in 1948. Recognized for its revolutionary design, combining comfort and original style, the DSW has remained a celebrated furniture classic of the 20th Century. The ergonomically curved form is perfectly adapted to the shape of the body and the combination of wood and black metal wires of the base add to the aesthetic value of the design as well as ensuring the stability of the chair. Overall Product Dimensions:21.5"L x 18.5"W x 32. "H Seat Height: 18".